This is the perfect toy for a baby boy just starting to walk. It’s soft so if he falls against it, it doesn’t hurt him. It is large & easy to roll around on the floor. Just perfect! We bought two different characters. i bought this for my 1 year old son for xmas he loves it, it rolls easily and rubber makes it durable yet safe. he loves the sounds it makes but its not to loud for mom. my only complaint is that its kinda hard to press to get it to make the sounds. 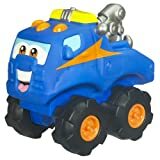 We got this truck for our grandson who puts everything in his mouth. He pushes it and chews on it and falls on it. Great first truck for 1 year old.